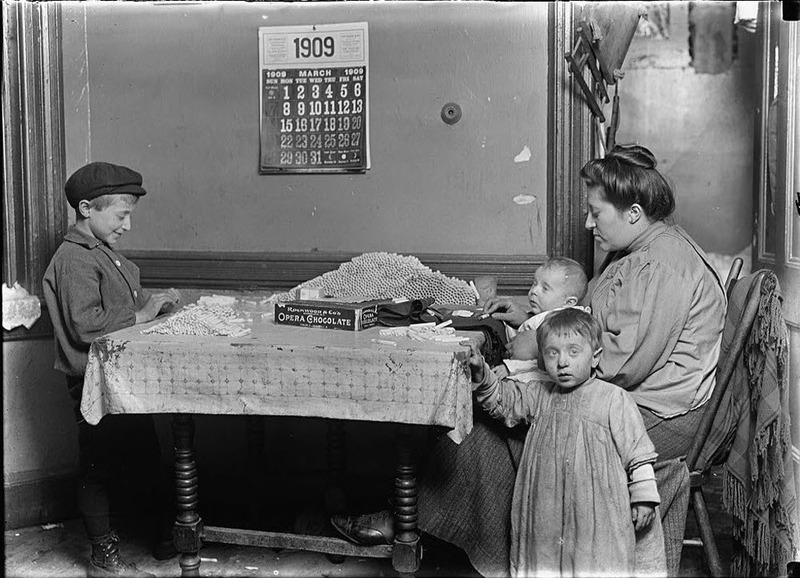 Join me on a visit to 1909 and come inside this New York tenement apartment, a dirty rundown hovel which is the home of this poor family. I am sorry that we are not able to bring anything to repay her hospitality. Our time machine only allows us to observe what life is like. We cannot change or make it better. It is a life that is a world away from the bright lights and optimism of the Belle Epoque. For this woman, a widow with 4 children ranging in age from an infant to a young teenager, life is non-stop hard work. She is lucky to be able to support her family with the kind of low paying work that many women took on in those days, because it allowed them to stay at home with the children. Here the mother is rolling a mountain of cigarets. One after another, for pennies a dozen. Her little baby is in her arms and she has mastered the art of holding it while her hands automatically roll cigarette after cigarette. In her mind, she is counting how many she has made so far, and she knows that she must make even more if they are going to be able to pay the rent and afford to eat. Her oldest son is helping. He is not as fast as her yet, but he is learning and hopefully, soon, the youngest ones will be able to help as well. Notice the dirty floor, tattered walls, the dirty malnourished children. There is no radio, no television, just bleak walls with chipping paint and piles and piles of papers to roll and a calendar reminding you when the next rent is due.